If you’ve ever been to UCF’s campus, you know that driving and parking can be a hassle. Getting to and from campus can be stressful – worrying about arriving to class on time with morning and evening traffic is tough. For those students who live off campus without a vehicle or do not want to purchase a decal, the UCF shuttle system is the next best option. Students with a valid student ID receive fare-free access to the off-campus shuttles. As long as you manage your time as to when your next class is and the times of the shuttle, you can conveniently get a free ride to UCF campus without dealing with the struggle of the parking garages and limited spots on campus. For off-campus students, taking advantage of this shuttle system saves you the cost of a UCF decal ($90 for the year) and the difficulty in finding parking. My roommate actually has never purchased a decal and only takes advantage of the free shuttle. This has saved her time and money for using one of the UCF’s many helpful systems. A lot of students also struggle with worrying about not having a car as a student living off campus. I personally don’t have a car and I use the shuttle every day, finding it to be convenient and easy to navigate. As long as you learn the shuttle times and manage your own time, it makes getting to campus hassle-free. Every apartment complex is different, but the shuttle usually runs approximately every 10-15 minutes during peak hours and 20-30 minutes later in the day. To check the shuttle system for your apartment complex and where their stop is and their times, check here and download the UCF Mobile App. During game days, there are also shuttles to help students get to campus to watch the game except for Northview, Tivoli, and Northgate because they’re so close to campus. To check that schedule and locations, visit here. 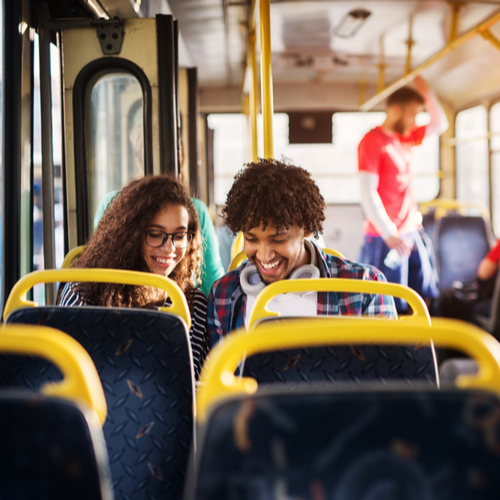 We are also lucky that with so much to do in Orlando, we also have a bus system called KnightLynx that takes students to and from campus surrounding areas, stops on Alafaya Trail and to Waterford. There is also a regular Lynx system that travels all around the city of Orlando. Whether you choose to bring a car or not, we definitely recommend taking advantage of the many bus options available for students.